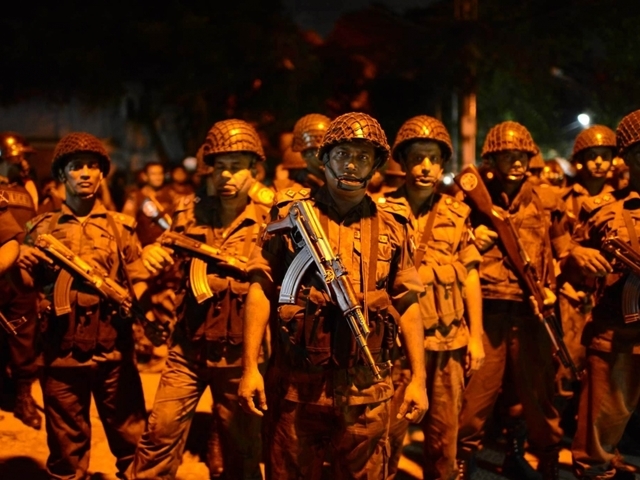 Security officials were searching Sunday for clues and criminal masterminds who might have set in motion the bloody hostage crisis that left 28 dead, including six attackers and 20 of the hostages, in the diplomatic zone of the Bangladeshi capital. Police were blocking all access to streets near the Holey Artisan Bakery in Dhaka's Gulshan, where heavily armed attackers holed up overnight Friday, torturing and killing some of their captives including nine Italians, seven Japanese, three Bangladeshis and one Indian teenager. Many details of the attack remain unclear a day after commandos stormed the restaurant and rescued 13 people. But police released photographs of the bodies of five attackers, along with their first names: Akash, Badhon, Bikash, Don and Ripon. Their families hadn't heard anything from them in months, according to police. "They are all Bangladeshis. They are from rich families, they have good educational background," Bangladesh's Home Minister Asaduzzaman Khan said. He identified them as being part of the banned domestic group Jumatul Mujahedeen Bangladesh, or JMB. He and once again refuted the possibility that the Islamic State could have been behind the attack despite the group claiming responsibility on Saturday and releasing horrifying photographs of what unfolded overnight Friday. The government insists the extremist Sunni Muslim group has no presence in the country, and in the past has suggested that any claims of responsibility for violence waged in the South Asian country are simply opportunistic attempts at grabbing global attention. Prime Minister Sheikh Hasina instead blames her political opponents of trying to create chaos in the country by backing domestic militants in waging a bloody crime spree that, until this weekend, has been mostly carried out by young machete-wielding men targeting individuals they say are traitors to extremist Islam. Victims have included atheist bloggers, gay rights activists, foreign aid workers and religious minorities. "Anyone who believes in religion cannot do such an act," Hasina said Saturday. "They do not have any religion, their only religion is terrorism." The attack Friday night was the worst by radical Islamists in the moderate and mostly-Muslim nation of 160 million. Unlike previous attacks, the assailants this time were well-prepared and heavily armed with guns, bombs and sharp objects that police later said were used to torture some of the 35 hostages trapped inside. The hostages were asked to recite verses from the Quran, to prove themselves Muslim, according to a witness. Those who passed were allowed to eat. Those who failed were tortured and slain. On Sunday morning, the first of two days of national mourning for the victims, investigators from both Bangladesh and Japan visited the restaurant to collect evidence. Western embassies issued travel warnings to their citizens, advising those who are now in the country to be vigilant and stay away from places frequented by foreigners in the diplomatic zone. The U.S. Embassy also urged its citizens and personnel to avoid traveling on foot, motorcycle, bicycle, rickshaws or other uncovered vehicles where attackers might be able to reach them.